Trying to think of favors for any party can be difficult. What is something that people could use but fits within your price budget? I turn to sweets a lot because most people love receiving candy or homemade treats to take home. 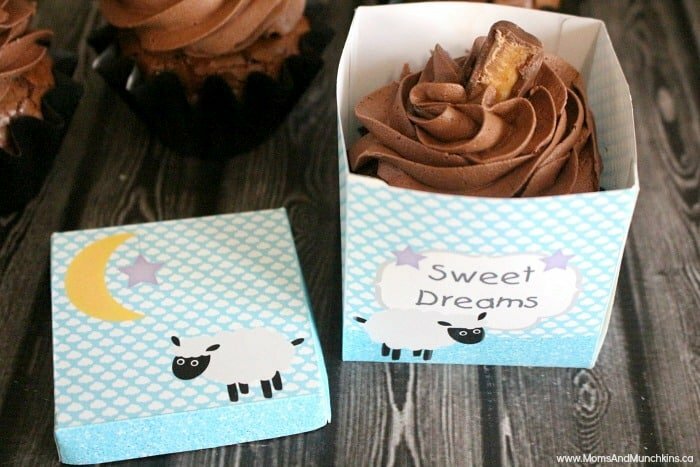 With this Sweet Dreams free printable baby shower favor box, simply print the boxes, cut them out, glue them together then fill with some delicious treats. In the free printable package, you’ll also find instructions for how to put them together. You’ll just need heavy cardstock paper, a color printer, scissors and glue. Looking for yummy dessert ideas for your party dessert table? Check out our Irresistible Desserts page. 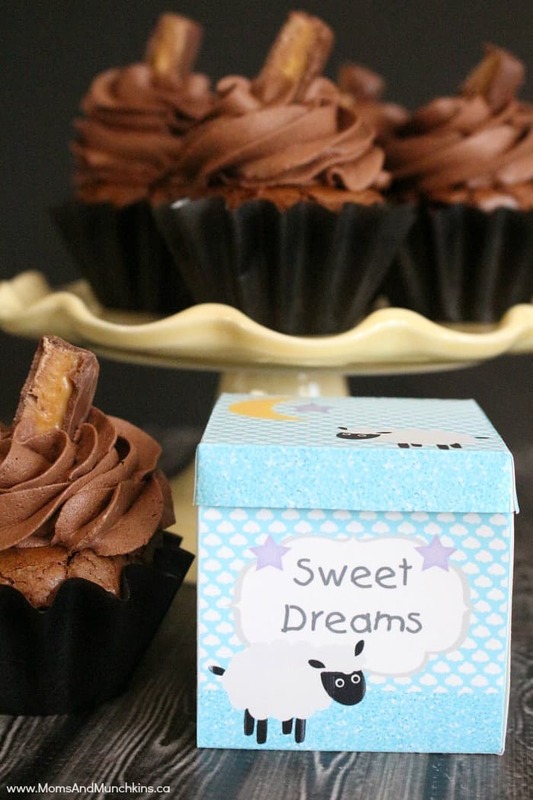 This Sweet Dreams baby shower favor box is available for FREE for our monthly newsletter subscribers! Signing up is free & easy – we have over 10,500 subscribers! Simply enter your email address, confirm your subscription, and you’ll be directed to a Thank You page with a link to the freebies page along with the secret password. This link and password will also be repeated in each of the monthly newsletters. Can’t remember your password? Just send me an email and I’d be happy to help you out! To help with your baby shower planning, check out our Baby Shower page with free printable games, theme ideas and more! One of our most popular posts here on Moms & Munchkins is this collection of Free Printable Baby Shower Games. We’re always adding new ideas for parties, recipes and so much more! Never miss an update by following us on Facebook, Twitter, Pinterest or see sneak peeks on Instagram. We also have a new YouTube channel filled with adorable cake pop & cookie tutorials, recipes, party ideas and more!